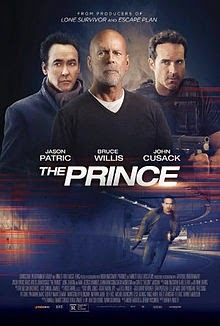 The Prince follows a fairly by-the-numbers plot of the angry dad (remember Liam Neeson in *Taken*?) who will break as many bones as necessary and let loose a hail of gunfire in order to bring his daughter to safety. Paul’s daughter seems a nice enough college-type girl, but as is always the case in movies like this, there’s more than meets the eye as regards her disappearance.The greatest effort seems to have gone into getting the look of the fight scenes correctly in an otherwise bland film. The action scenes; be it the shootouts, exchange of blows during the scuffle or the car chase, are mechanical and obviously imbalanced and unrealistic. This is very obvious in the scene where Paul carries his drugged daughter out of the drug lord’s lair.Overall, the film falls short on the directorial front and what adds to the disappointing fare is the bleeping of the cuss words in the dialogues owning to the censor board’s diktat.Watch it only if you have nothing better to do. The way too derivative script. The corny dialogues. The insipid acting. The direction, probably non-existent! The utter pointlessness of Jessica Lowndes. John Cusack’s wig (or real hair, who cares at this point?). The taken-for-granted ness. A revenge action drama with repetitive flashbacks for no good reason, The Prince leaves you with more questions than answers. And you really don’t intend spending money on watching a man going through life, GTA-style. Because, well… that’s exactly what this film feels like.